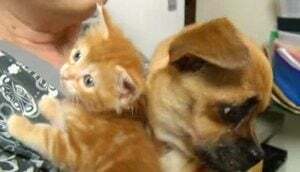 What the kittens needed was a mom, and they found one in the most unlikely candidate: a dog. 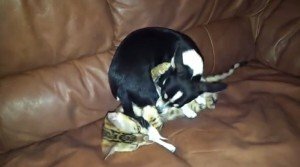 Yes, that blurry little yellow thing is a Chihuahua! This puppy is happy to finally have someone his own size to play with. 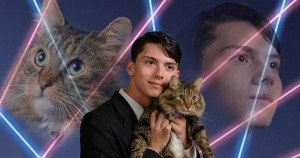 He thought they’d say no, but New York high school senior Draven Rodriguez was allowed to have a picture of him holding his adopted feline in the annual yearbook.